For adults who hate the thought of metals braces, Invisalign Clear Braces can straighten your smile and transform your appearance. 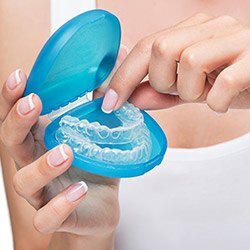 The Invisalign system gradually shifts teeth with gentle pressure generated from clear, custom, and removable mouthpieces we call aligners. You can achieve a perfect smile, and no one will even know that you are undergoing orthodontic treatment. We’ll start by capturing three-dimensional images of your teeth and mouth. Dr. Boehmer will plan your treatment course in a painstakingly customized fashion. An Invisalign-certified lab will generate your unique set of clear aligners. You will wear each aligner for around two weeks before switching to the next tray in the set. Over the course of 10 to 18 months, Dr. Boehmer will monitor your progress with regular appointments. For faster results, please plan to wear the aligners around 22 hours a day. Remove your Invisalign aligners when you'd like to eat a meal, brush your teeth, or for special events.